Mercedes-Benz of Lynnwood Blog: For Hello Kitty Fans! If you're a Hello Kitty® fan and you drive a Smart ForTwo, here's your chance to meld the two worlds. 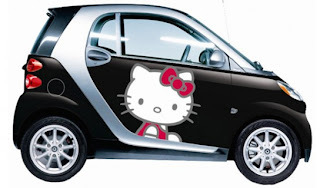 Sanrio and Smart ForTwo have joined forces to offer both full and partial wraps in unique Hello Kitty® designs. From the partial wraps like Hello Kitty® Forever and Hello Kitty® Supercute to the full wrap Hello Kitty® Everywhere, you can turn your Smart ForTwo in to a pink paradise. Starting at $1,700 for full wraps and $550 for partial wraps, this is an affordable way to show the world your Hello Kitty® love.